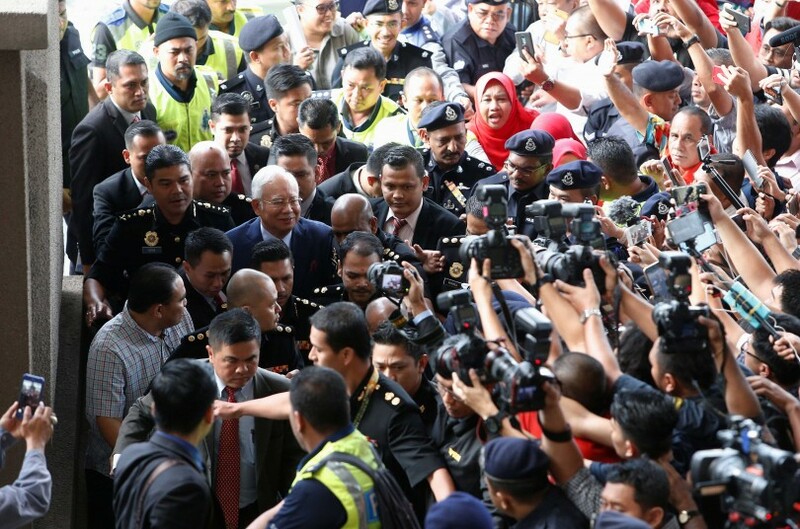 Press photographers jostled for pictures of Datuk Seri Najib Razak upon his arrival at the court. KUALA LUMPUR – July 4, 2018: The first appearance of former prime minister Datuk Seri Najib Razak in court today was coloured by singing supporters, screaming critics, a berated Attorney-General, a botched press conference and injured reporters. The scene at the court complex was indeed choke-full of drama as Najib was charged with four counts of criminality over the controversy surrounding SRC International Sdn. 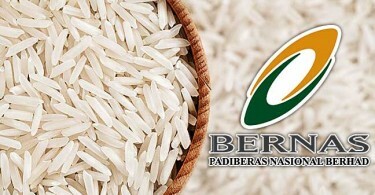 Bhd., a subsidiary of 1Malaysia Development Berhad. The first to make a spectacle was a group of Najib’s supporters who started a tongue-in-cheek kerfuffle with the police after the latter scolded them for belting out “Allah Selamatkan Kamu” (God Save You). To the unfamiliar, Allah Selamatkan Kamu is an Islamic rendition of the “Happy Birthday to You” song. “Why can’t we sing?” asked a more vocal member, Tun Faisal Ismail Aziz who is also the deputy division chief of Putrajaya Umno. “Because this isn’t a karaoke bar…. it’s a court,” was the witty comeback from one police officer who seemed to be annoyed by the group’s antics. When Najib’s entourage arrived later, several local and foreign reporters and photographers suffered minor injuries in the commotion that followed. One had to seek treatment at a nearby hospital after she suffered a nosebleed. According to the charge sheet, Najib could be jailed for up to twenty years if found guilty of any of the four charges. After Najib pleaded not guilty, High Court Judge Datuk Mohd. 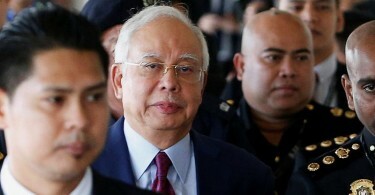 Sofian Abd Razak set 21 days from February for the trial and allowed Najib a bail of RM1 million in two sureties. The judge also agreed to issue a gag order after Najib’s lead counsel Tan Sri Muhammad Shafee Abdullah pointed out that it was needed to prevent his client from being tried in the media. After the proceeding ended, throngs of reporters and spectators began to congregate in front of the complex as it was said to be where AG Tommy Thomas will hold his press conference. When he arrived, the group of Najib’s supporters who were there turned rowdy again and began berating Thomas, demanding him to conduct so speak in Bahasa Malaysia. Their demand was in the wake of Thomas’ request in the court to conduct the legal proceeding in English despite the charge sheets prepared by his team being written in the national language. “Guna Bahasa Malaysia! (Use Bahasa Malaysia)” so went the crowd’s repetitive and deafening chant. 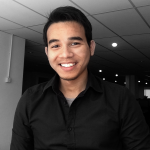 Thomas aborted the press conference when it became apparent that the crowd was becoming increasingly agitated, especially after actress Ellie Suriaty Omar had her MyKad taken by the police. It is believed that the 48-year-old was among those who instigated the crowd. Journalists were later informed that Thomas was to hold a press conference inside the complex, during which he disclosed how the case’s gag order was only limited to the SRC controversy. “We are against it in principle because it is against free speech. Also, we won’t know how wide the scope is and whether the court has jurisdiction to determine what should be the elements,” said Thomas. The gag order will last until August 8, when the prosecution’s appeal against this will be heard. On a poser over the legality of Najib’s arrest yesterday, Thomas said the AGC played no role in it. “You have to ask those within the task force,” said Tommy who was a lawyer before his appointment as AG last month. The arrest created a stir among legal savvy Malaysians, with the Bar Council questioning how its announcement was done by a task force to probe 1MDB and not by the MACC or police. MACC chief commissioner Datuk Seri Mohd. Shukri Abdull later issued a statement to say the word MACC was inadvertently left out of the statement from the task force. While repeated attempts today to get clarification on the matter from the task force was unsuccessful, an anti-impunity movement leader argued that the arrest was unlawful. “A task force is investigative by nature. They do not have the legal standing to instruct or do arrests,” said Raggie Jessy who leads the Malaysiaku Tanahairku movement. Jessy argued that not only does the task force have no basis to issue the arrest order, its composition itself is questionable. The task force is led by former AG Tan Sri Abdul Gani Patail, Shukri, his predecessor Tan Sri Abu Kassim Mohamed and federal Special Branch director Datuk Abdul Hamid Bador.